Music City Star New Year's Eve Express 2017-18 wristbands must be presented to security personnel to enter the checkpoint area at Riverfront Station. 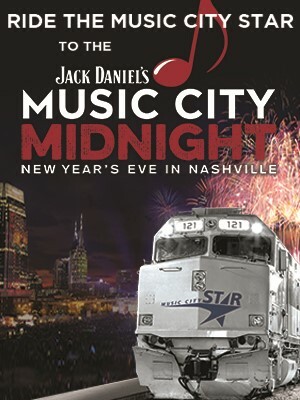 Ride the Music City Star to the Jack Daniel's Music City Midnight: New Year's Eve in Nashville. Departure schedule below. • Lebanon Station (334 W. Baddour Pkwy.) at 6:00 p.m.
• Martha Station (65 Martha Circle) at 6:15 p.m.
• Mt. Juliet (22 E. Division St.) at 6:29 p.m.
• Hermitage (4121 Andrew Jackson Pkwy.) at 6:41 p.m.
• Donelson (2705 Lebanon Pike) at 6:54 p.m.
• Arrive at Riverfront Station at 7:09 p.m. The return train will depart from Riverfront Station at 1:30am and will stop at all stations. Parking is free at the outlying stations and is not available at Riverfront Station. Tickets will be on sale until 24 hours prior to departure or until they are sold out, whichever comes first.